I woke up at 10:30am from the best sleep this morning, I didn't want to move. I don't want to get to graphic but, lets just say there was drool involved. 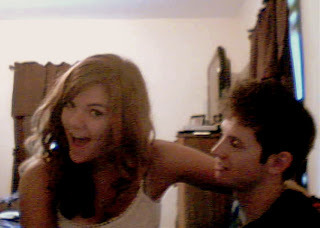 By the time I showered and put on a little summer dress Alec was over and we were making homemade pancakes. I made his special with chocolate chips. This picture above is from a while ago; I absolutely love it because I look so incredibly happy and Alec looks like he is staring lovingly at me. I love making food for Alec because I am good at cooking and baking and he appreciates being fed! 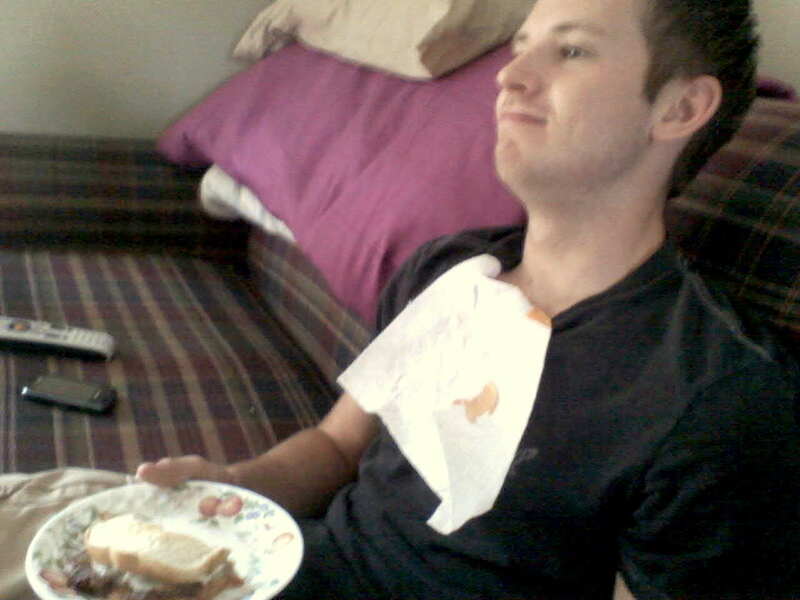 This picture below is from when i made him lunch (steak-umm and provolone sandwiches) while he was playing xbox. After breakfast he left for work and I spent the remainder of the day sewing! I adore days like this where I have nothing to do except sew. I made my last set of "block swap" squares with some ugly fabric but, they were basically the last two color combinations of floral print I had left. The block swap is over with this month so all I have left to do is put all the squares together into a quilt. With my last set of blocks done, I went to the quilt shop to drop them off and then took Shadow, my dog, for a walk. I keep ignoring my goal to exercise daily so I decided to work on it today. I found this amazing little idea today while blog surfing! My mom had been asking me to make her something to give as gifts to her pregnant friends and I knew this was it. Check out the link if you want but, I'll have a detailed post soon on it because its almost done already! I also finished another quilt but have not gotten pictures up yet. I went up to my Aunt's house and she gave me a jelly roll and tons of fabric all ready to make a new quilt! She's the best. I definitely have many projects to keep me busy this month. So, more to come. On another note, here are some pictures from Brockport Orientation last month. These are the girls I was hanging out with during my trip and I can't wait to see more of them next month! This was right before the end of the night. There was kan-jam, a DJ, free stuff, chicken wings and much more. I figured I'd post the photos just for fun. Here is my cat, Meowzers, eating some yogurt. This is an old picture but, she enjoyed today just as much as I did. She laid asleep in the same spot almost the entire day, except for when she decided to relocate to the sewing room. She kept crawling on my ironing area and sprawling out right where I was working. Hopefully I find more days like this in the near future. Hope all of you are still creating. Will be sending your letter soon.